SIMCom Wireless Solutions is the leader in high quality wireless modules for different technology platforms in GSM/GPRS/EDGE Module, WCDMA/HSPA and TD-SCDMA. By partnering with third parties, SIMCom Wireless provides customized design solutions in M2M, WLL, Mobile Computing, GPS and other applications. SIMCom Wireless also provides ODM services for customers. I2R Labs can supply range of modules SIM6216C AND SIM6320C from SIMCOM at highly competitive pricing. 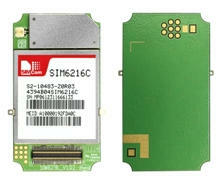 Looking for SIMCOM CDMA-EVDO Module ?